Q: I enclosed a sketch of our living room which measures 13 feet 6 inches by 20 feet 3 inches. 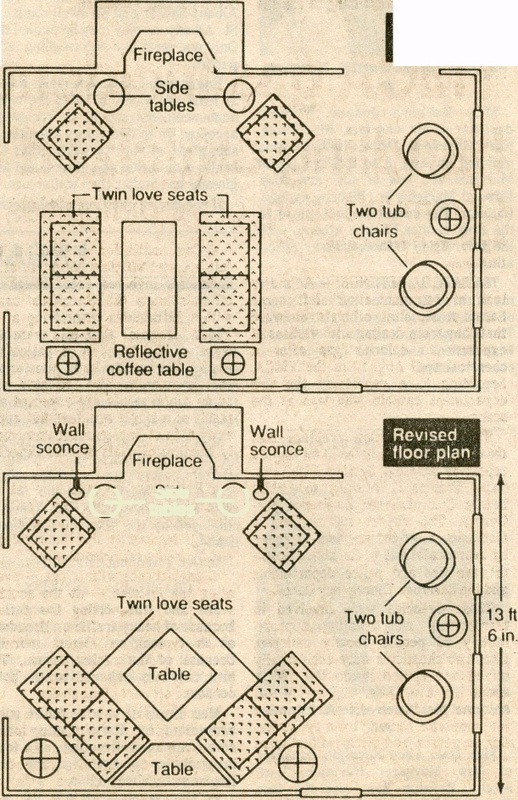 As regards to furniture arrangeÂ­ment, I think I would like two loveseats facing each other opposite the fireplace with a 24-inch by 48-inch coffee table between them. I have always wanted a pair of loveseats in this room. Currently I have a sofa on the long wall opposite the fireplace and can't wait to get rid of it. To my eye, it emphasizes the length of the room which I don't want to do. I have two velvet wing chairs which I thought would work well on either side of the fireplace with small round tables next to them. At the front of the room, under the two windows, I was thinking of using two tub chairs with a table and lamp between them for extra seating when we need it. I have a difficult time visualizing things and often what I think will work, doesn't. Before I make more expensive mistakes, I wanted to ask your opinion. I would appreciate any thoughts that you might have. A: I'm certain that I don't need to tell you that your room is a difficult one to arrange. The fireplace is the logical focal point for your furniture grouping. Because it's so far off center in the room, it does create some design problems. However, I have always felt, and still do, that the most difficult rooms often become the most interesting and most successful because they are so unusual. I graphed your room out with two loveseats facing each other opposite the fireplace. I don't feel as though it works very well for a couple of reasons. The loveseats placed perpendicular to the wall not only visually cut the room, but the space for the flow of traffic isn't adequate. When you center the loveseats opposite the fireplace, the one closest to the end of the room virtually blocks off the entire entrance to the dining room. Also, there is only 2 feet 6 inches between the end of the loveseats and the wing chairs which is not enough space for your major flow of traffic. It would be cramped and awkward. The loveseats would not be visually appealing if placed directly against the wall with no end tables. They would feel too tight and the arrangement would look forced. Consequently, elimiÂ­nating the end tables to create more open floor space is not a viable solution. I think your comments about the effect of a long sofa opposite the fireplace are valid. It would emphasize the length of the room, which you correctly don't want to do. The wing chairs in front of the fireplace would work nicely as well as the two chairs and table for extra seating under the front windows. How about using your idea of two loveseats, but angling them instead of squaring them off? I think it gives the room an entirely different feeling of proportion, and doesn't appear to cut it as much. The traffic pattern is tremendously improved and the two chairs and table under the front windows don't appear to be so isolated. Also, I like the way the angle of the loveseats relates nicely to the angle of the wing chairs. There's another advantage to the plan. You have the option of purchasing loveseats that are slightly larger than the standard 60 inches. Even will just 6 inches additional length â€” (inches â€” the feeling is far les cramped. This is especially true when two people who don't know each other well are seated on the same love seat. The extra 6 inches will make it feel more like a small sofa than a loveseat. I would advise purchasing loveseats with small scaled arms and no side pillows with the idea of maximizing the area for seating. Every inch counts. 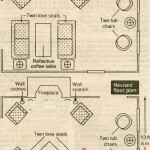 With this altered plan, I would place a console table between the loveseat as shown with art hung above it. This arrangement will visually balance the fireplace in the room. I would use a square 36-inch coffee table instead of a rectangular one. I think you can see by the graph that this would be more appropriate when the loveseats are angled. As for lighting, I would use two standing lamps behind the loveseat, one table lamp between the two chairs, and install two wall sconces above the wing chairs on either side of the fireplace. Not only do you need light on that side of the room, but the sconces would be very effective accents for the focal point â€” the fireplace. A floor plant behind the loveseat in front of the window on the side wall would soften the angle and be a nice addition to the room. When you examine the two graphs; the changes are relatively few, but the effect is tremendously different.